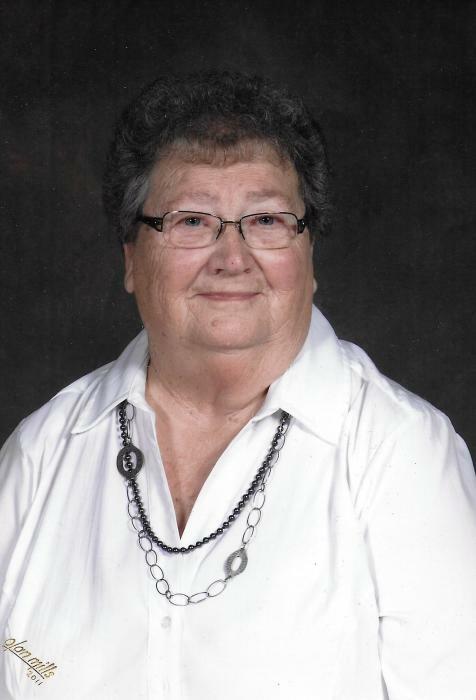 US Hwy 56 and Winchester Ave.
Rose Marie Elpers, a long-time resident of the Kinsley area, died Sunday the 31st of December 2017 at the Edwards County Hospital in Kinsley. Rosie was born on February 15, 1933 north of Kinsley, the daughter of Carl N. and Bertha M. (Herbers) Tasset. She was a homemaker and member of St. Nicholas Catholic Church, Kinsley where she served on the altar society. She enjoyed socializing, traveling and playing cards with friends. On May 14, 1952 Rosie married Vincent John Elpers at St. Nicholas Catholic Church of Kinsley. Surviving are her four daughters; Diane Demoret of Des Moines, Iowa; Mary Jayne Marsh of Medicine Lodge, KS. ; Sharon Bertrand of Odessa, TX. ; and Joyce Smith of Great Bend, KS. ; 10 Grandkids and 8 Great Grandkids. She was preceded in death by her husband Vincent Elpers and two sisters Lucille Tasset and Frances Marie Halsig. Rosary is scheduled for 6:30 pm on Wednesday, January 3, 2018 at St. Nicholas Catholic Church, Kinsley. Funeral Mass is at 10:30 am on Thursday, January 4, 2018, with Fr. John Strasser presiding. Memorial gifts may be made to the St. Nicholas Parish Hall in care of the Funeral Home.